The Victoria Room is located on the 2nd floor and has an old-fashioned floral motif. The bedroom features a lighted fireplace with a beautiful stained glass screen. 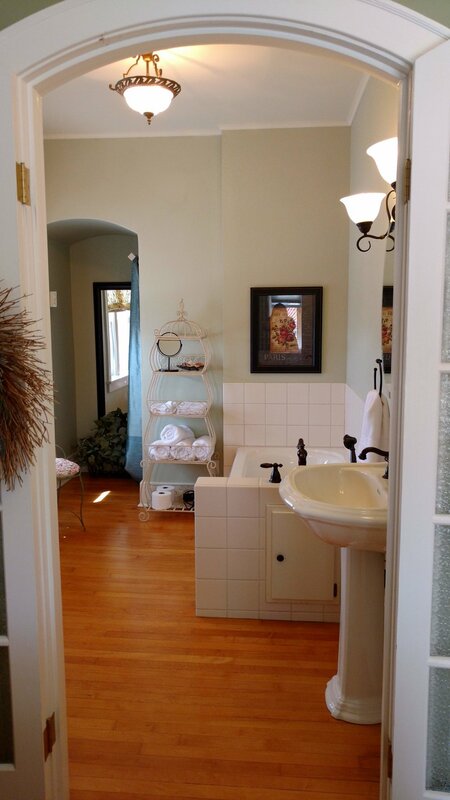 Both the bedroom and en-suite bath with jetted whirlpool tub have inviting views of downtown Redwood Falls. This room can sleep up to 2 people. *We offer a discount of $10/per night if you would like just the room and NO breakfast. This option is only available if you call us to make your reservation. Business rates available, please call us for more information. The Falls Room is located on the main floor and has a vintage rustic feel with its simple and sturdy furnishings. It has an en-suite bath with a step-in shower that can easily fit two adults. There is also a Juliet balcony on which you can enjoy your morning coffee. Due to the unique architecture of our building, there is a three step staircase up to this room. This room can sleep up to 2 people. The Sunroom Suite is located on the 2nd floor and is perhaps the sunniest room in the B&B. This two room suite has its own sun room with views looking out towards Alexander Ramsey Park. The en-suite bath features a jetted whirlpool tub and lots of light. This suite also offers a comfortable twin bed in the attached sun porch to accommodate a third guest at an extra fee ($30/night). We also rent out the entire B&B! It is a great option for families and groups that want privacy and the feeling of being in your own home. 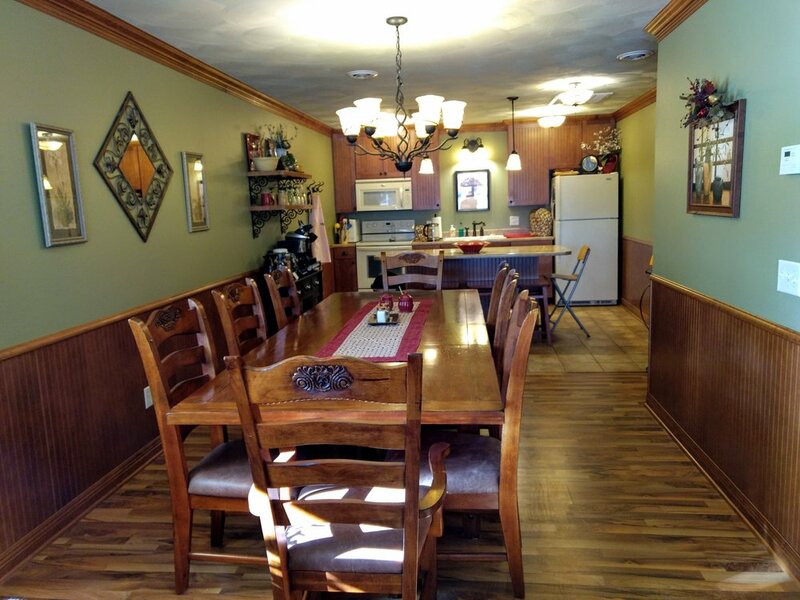 This option includes the full use of the kitchen and the main floor. 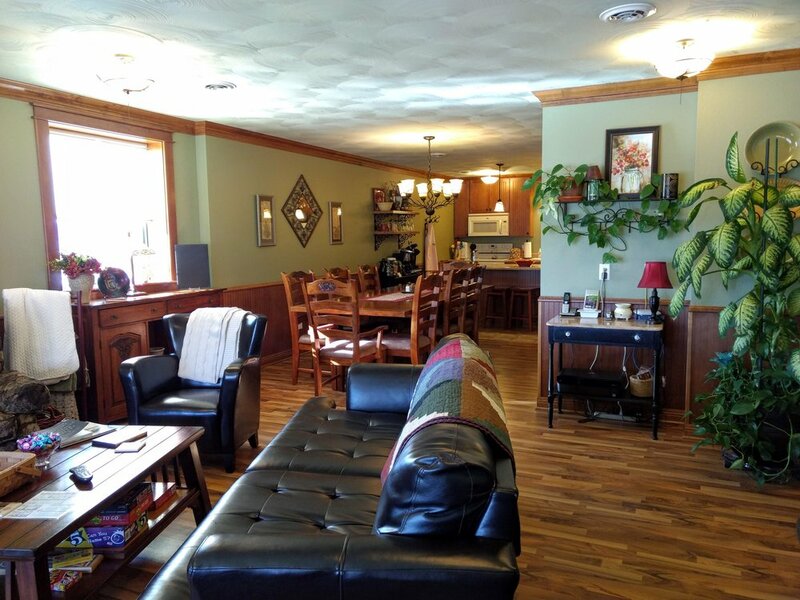 The entire B&B rental can accommodate up to 7 people. This special rate is only available when booking directly through us over the phone! These special rates can only be obtained by calling us at (507) 627-1875 and booking directly!